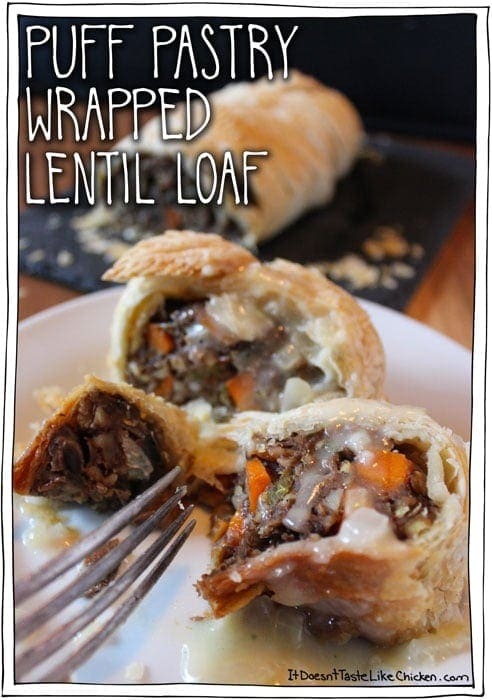 Lentils, toasted nuts, sautéed winter veggies all wrapped up in a FLAKY glorious puff pastry. Decadent, hearty, rich, flaky, did I mention flaky? Drizzled in Quick Vegan Onion Gravy or your favourite warmed BBQ sauce, and did I mention flaky!? I would like to introduce you to my Puff Pastry Wrapped Lentil Loaf. Hello, nice to meet you. Please don’t be offended when I devour you. This, my friends, is what you call a vegan holiday main dish. It was important to me when making a vegan holiday main for the season that it wasn’t just darn tasty, but it had to have a real ooh and aah factor. Oh boy, (or girl), does this deliver. I’m pretty sure you could wrap a carrot in puff pastry and everyone would be wowed. I mean, come on, puff + pastry. Thank you. Slow clap. This recipe takes a little bit of work, but the brilliant news? You can make almost all of it ahead of time! Prepare the filling the day before. On the day of, turn on a relaxing holiday soundtrack, select your finest apron, ladies: apply your reddest lipstick, gentlemen: straighten those bow ties, then roll out your pastry and effortlessly braid wrap the lentil loaf as your guests arrive, making sure they notice how impressive and relaxed you look. (Lipstick and bow ties are not necessary but recommended for added kitchen glamour). To make Puff Pastry Wrapped Lentil Loaf: Add the lentils to a pot with the vegetable broth, cover, and bring to a simmer and cook for 35 to 40 minutes until liquid is absorbed and lentils are soft, even mushy. Then take an immersion blender or potato masher and mush them up until about two-thirds of the lentils are mushy. This lentil mush makes everything hold together nicely. Yum, mushy! In the meantime, chop the nuts and put them in a dry pan over medium heat. Toast them, keeping an eye on them for about 10 minutes until they are all toasty and fragrant. Remove from the pan and set aside. In a small bowl mix together the flax or chia and warm water and set aside. Flax will take about 10 minutes to thicken whereas chia will thicken almost instantly. Heat the olive oil in a pan over medium-high heat, then sauté the onions, carrots, and celery until they begin to soften up, about 5 minutes. Add the mushrooms and sauté another 5 minutes until the mushrooms have softened and become juicy. Add the garlic, salt, pepper, thyme, and cayenne and sauté about 2 minutes more. Remove from heat. In a large bowl, mix everything together. The lentils, toasted nuts, veggies, flax mixture, the oats and the flour. Preheat over to 400F (200C). On a lightly floured surface roll out one of the puff pastry sheets until you get a rectangle that is about 10 inches by 14 inches. Transfer the pastry sheet to parchment paper. Take half of the lentil mixture and form a loaf shape down the middle of the puff pastry, leaving a bit of room at both ends. Pat the mixture into a firm log. Cut strips down each side about 1 inch wide. Cut off the top two and bottom corners and set aside. Now fold up the top flap over the end, then take the top left strip and fold over the loaf. Take the top right strip and fold that over, making an x. Do this all the way down the crisscrossing strips. Try to keep the strips close together leaving only small gaps. Once you get near the bottom, fold the bottom flap up, then finish crossing the last strips tucking the ends into anywhere they look good. If you want to be all fancy, you can use the set aside corner pieces of pastry to cut little leaf shapes, (or whatever shape you like) and tuck them into the weave. Repeat with the remaining pastry and lentil mixture so you have two loaves. Brush the top with non-dairy milk and pick up the loaf by the parchment paper and place onto a baking sheet. Bake for about 40 – 45 minutes checking every now and then until it’s all golden brown and gorgeous. Serve the Puff Pastry Wrapped Lentil Loaf while hot with Quick Vegan Onion Gravy or warm BBQ sauce. The perfect vegan main dish for Thanksgiving or Christmas. Makes a great centrepiece for the table and tastes insanely good! Decadent, hearty, rich, flaky, all drizzled with vegan gravy. To make the lentil filling: Add the lentils to a medium pot with the vegetable broth. Cover, and bring to a simmer and cook for 35 to 40 minutes until liquid is absorbed and lentils are soft, even mushy. Take an immersion blender or potato masher and mash the lentils until about two thirds of the lentils are mush. This lentil mush makes everything hold together nicely. In a small bowl mix together the flax or chia with water and thicken. Flax will take about 10 minutes where as chia will thicken almost instantly. In a large pot, heat the olive oil in a pan over medium high heat. 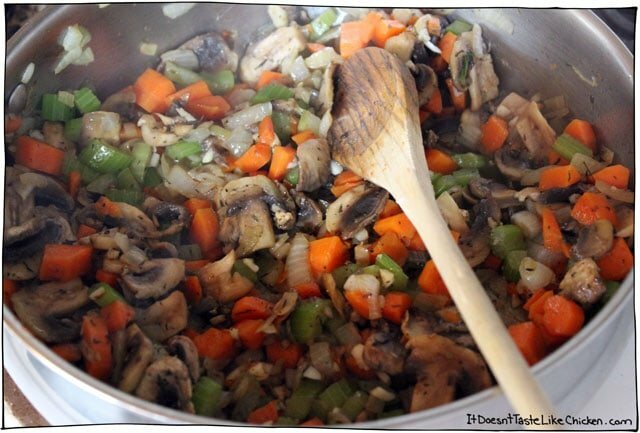 When hot, add the onions, celery and carrots and sauté until they soften and begin to brown, about 5 minutes. Add the mushrooms and continue to cook another 5 minutes until the mushrooms have shrunken and become juicy. Add in the garlic, salt, pepper, thyme, and cayenne and sauté about 2 minutes more. Remove from heat. 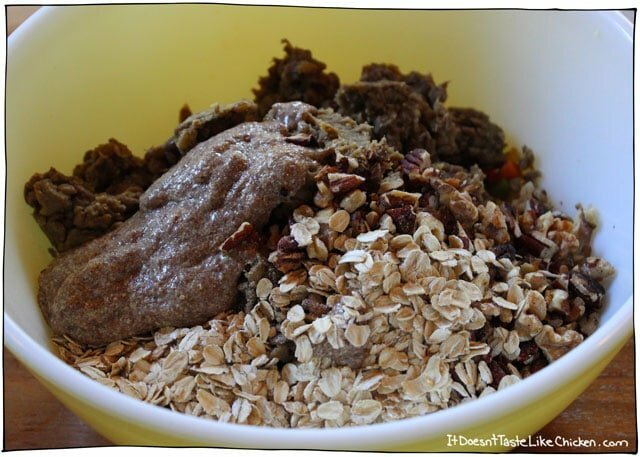 In a large bowl, mix the lentils, toasted nuts, veggies, flax mixture, oats and flour flour together, and set aside. To weave the puff pastry: On a lightly floured surface roll out one of the puff pastry sheets until you get a rectangle that is about 10 inches by 14 inches. Transfer the pastry sheet to parchment paper. If you want to be all fancy, you can use the set-aside corner pieces of pastry to cut little leaf shapes, (or whatever shape you like) and tuck them into the weave. Repeat with the remaining pastry and lentil mixture so you have two loaves. Brush the top with non-dairy milk and move to a baking sheet. Bake for about 40 - 45 minutes checking every now and then until it's all golden brown and gorgeous. Serve hot from the oven with Quick Vegan Onion Gravy or your favourite BBQ sauce heated up. You can prepare the lentil mixture up to 3 days ahead of time, store in an air-tight container in the fridge, then wrap your loaves when ready to bake. Would love to make this for my family but my husband is allergic to mushrooms. Do you think a vegan crumble would work in place of the mushrooms? That should work, or you can just skip it and it still works out fab. Enjoy! Puff pastry is best baked fresh. I wouldn’t store the wrapped puff pastry loaf more than a couple of hours ahead of baking for best results. You can make the lentil mixture ahead of time tho. Enjoy! Can I wrap it in the puff pastry, refrigerate it for a few hours, and then bake it or would it be better to bake it the day before and then reheat? Hello! So happy to find this recipe! We are hosting thanksgiving this year and I’m so happy to have some vegan dishes this year. However, we do have a nut allergy so I will be omitting them. Will this compromise the texture too much? I was thinking about adding pumpkin seeds or sunflower but the only ones I have on hand are salted. Any suggestions? Also I was thinking if adding a handful of chopped spinach for more green.. thoughts? Thank you!! I think my response is too late, but yes, seeds would be a lovely alternative. If they are salted already, then you may just need to reduce the salt in the recipe slightly. Enjoy! I have made the past 3 years for both Thanksgiving and Christmas and it is always a hit – even with the meat eaters! This year we are travelling for Thanksgiving to a rented house so I don’t know what kitchen appliances and tools will be there. I don’t want to freeze it, but can I make all or part of this 3-4 days ahead of time and bring it with us or does it all need to be made at once and cooked at that time? So happy you love it, Vicki! You can make all of the filling ahead of time and then wrap it up the day of and bake. Enjoy! I’d say about 3 days in the fridge. love your site and your book (it’s a regular go-to for me! Quick question – do you think a gluten free pie dough would work for this lentil loaf? Finding a GF puffed pastry borders on impossible and making it homemade is super labour intensive. So happy to hear that!! I’ve actually never worked with gluten-free pie dough, so I’m afraid I have no idea. You could push the lentil mixture into a loaf pan lined with parchment paper, and brush the top with a little bbq sauce and bake it that way. It won’t be wrapped, but it will still be pretty and delicious. Hope that helps! I made this for Christmas and it was excellent. I made this for our Thanksgiving Feast this year. It’s very yummy and now a holiday tradition. Thank you!! Hi. Looks amazing!! If I cook in a convection oven, does the time need to be adjusted? Also, since recipe makes 2 loaves, can I freeze half of filling to make a couple weeks later? I’d only be making for my husband and myself so two loaves would be too much! Hi Michelle, I’m not sure about the convection oven as I never use that feature on my oven! You can definitely freeze half of the filling or you could half the recipe. Enjoy! Could this be made, wrapped, travel an hour, then be put into the oven to bake? Hi Kelly, I think that should work just fine. You could also bake it ahead of time and reheat it. Enjoy! For some reason I thought puff pastry was the same thing as crescent rolls… will it turn out okay? Kat again… just one more question if you don’t mind answering. Since this makes 2 loaves, and I’ll be feeding meat eaters this thanksgiving, I was thinking about adding tofurky sausage to one of them. What do you think, good or bad idea? If it’s a good idea how would you suggest I incorporate it into the dish? As for the tofurkey, I wouldn’t add that. This recipe has been balanced in flavour and texture as is, and I know my meat eating family loves it! Enjoy! Hi Kat, yeah it’s not the same thing. I would recommend sticking to puff pastry as it will provide that gorgeous flaky crust. I’m not sure how crescent rolls would turn out. Hope that helps! Thanks, Sam! I’m sure they’ll love it. Everything of yours turns out amazing. Happy Thanksgiving! Hello there, This recipe comes highly recommended and I am going to make for Thanksgiving. I just have one question. The list of ingredients calls for two pastry sheets but the instructions say to roll out one pastry sheet. When is the second sheet of pastry dough used? Thanks so much for sharing your recipes and making transition to vegan such an easy, fun and delicious pursuit. The recipe makes two loaves so further along in the instructions you will see that it says repeat with the remaining puff pastry and lentil mixture. Enjoy! Hi I’m making this for thanksgiving for the first time! I don’t have chia seeds or flax handy – can I skip this step and/or use something else? The chia or flax helps bind the mixture together so you will need that to help hold the loaf together. Enjoy! Super delicious!! It didn’t last in my house. I’m going to be making it for a cooking class I’m teaching next week, so get prepared for more subscribers! Hi Judy! You can just leave them out. The texture will have less of that mushroom chew (which I take it is a good thing for your husband), but it is still great. Enjoy! I made this last night, and it was a hit with both my meat eating husband and vegetarian daughter. I’ve got all my ingredients ready to make but just realized I purchased phyllo dough…do I need to go back to the store or should I try it out? Hey I have some pie crust handy, could I trade it out for the puff pastry? No, pie crust is a very different texture than puff pastry, it wouldn’t work too well for this. Delicious – thank you! This went down well with both veggies and omnivores for a family Christmas meal. There was half a loaf left over which kept well in the fridge and reheated just fine the following day, I covered it loosely with foil to stop the pastry over-browning (too tight and it might keep in too much moisture, making the pastry a bit tough). If you don’t want to decorate the loaves with the pastry trimmings, try making savoury “bites” by spreading on a little olive tapenade, then put them on a cookie sheet and bake for a few minutes until puffed up and lightly golden at the edges. I’m making this for a vegetarian Christmas dinner, can the recipe be doubled? I just wanted to say I made this today and it was a hit. It came out (almost) exactly like your photos and tasted great, to boot. I hadn’t seen your blog before searching for a vegan loaf the other day, so I look forward to checking out the rest of your recipes. Thanks for doing the leg work – great recipe. Haha! That’s ok! So happy you loved the recipe Varsanarani, and I hope you get to enjoy many more recipes 🙂 I look forward to seeing you around. Hi! I’m making this for Christmas Eve dinner at my mom’s. Can I reheat it so it’s warm? I’m planning to bake it a few hours before going to her house then reheating when I get there. Shall I underbake slightly? What temp and how long you think? Thanks! Hmmm puff pastry isn’t really great reheated. It’s really best fresh out of the oven. If possible, it would get the best result if you baked it at your mom’s house. Hope that helps! Thanks Sam! I’ll try to figure it out. I’ll let you know how it turns out. Happy Holidays! So happy with how this turned out! I just made this loaf for a friendsgiving Saturday. It’s been something that I’ve been wanting to try for a while but needed the occasion. So AMAZING!! I mean so delicious I wondered why I waited for guests. I could eat the whole thing myself!!! I prepped the day before and the day of was effortless. I’m seriously going to make this for weekday meals now cause it was that good. I want to eat it everyday! lol I’ve made and loved a lot of your recipes (and can’t wait for your cookbook) so thank you for these wonderful recipes! This looks so yummy! What would you suggest for substituting the nuts out? I have a nut allergy. Thanks! Hi Brooke, you could just skip them and that would be fine. I did that for a friend who had a nut allergy. Enjoy! I made this today, and asked my husband to rate it from 1-10. He said a 10! And that since we started eating heathlier about 3 months ago, he said this was by far his favorite! Now Im going to go check out the rest of your recipes!! Haha yay!!! So happy you and your husband loved it so much Jackie 🙂 I hope you continue to enjoy more of my recipes! I was thinking of making this for Thanksgiving, but my husband hates mushrooms. Can I leave them out or is there something I can substitute for the mushrooms? Oh good. It’s rainy out and thought I’d make it for dinner tonight and reviewed the ingredients and I have everything except mushrooms. Does it freeze well? Anyone ever say they froze leftovers? I hope you love it! I’ve never had any leftovers! Haha. So I don’t know I’m afraid. But my guess is the pastry portion would get a bit soggy. Did you substitute something else for the mushrooms or just leave them out and increase the other vegetables to make up for the volume? Just leave them out and you can increase the other vegetables a bit if you like. Enjoy! I made this today. I had trouble with the pastry tops of the loaves burning about 10 minutes into the cooking time. But then the rest of the pastry (on the sides) hadn’t really cooked enough, nor had the inside. I ended up having to slice up the loaves and put the slices on the baking sheet back into the oven. Which kind of worked. It still came out well and got good reviews from our guests. But I’m wondering how to avoid that next time. Do you cover the loaves when cooking? Any other tips? I had two loaves on different racks (middle and bottom) and both tops burned. My oven does run slightly hot, but I put it a little lower temp accordingly (and it’s not normally that far off, just some things are done a few minutes earlier). But thank you for the recipe. I will still make again, just hoping to tweak something to avoid this problem next time! Oh no! That’s too bad Beth. I have never had that problem before. I recommend purchasing an oven thermometer, which can ensure your oven is the correct temperature. Hopefully that will help you get a better result. You wouldn’t want to cover it as it would steam the loaf. I’m glad it was enjoyed anyways! One of the best recipes ….. ever. Seriously. When I want something special – this is my go to dish. Looks good (not as good as Sam’s as i get fumble-fingers when trying to “braid” the pastry). But even then it is an impressive dish that makes everyone want some. Very, very satisfying and delicious. This is making salivate! Can I make it with a pastry crust instead of puff pastry? Hmm…. I don’t think that would work. Pastry crust is usually pretty heavy and delicate, where puff pastry is really light and malleable. I would stick to the puff pastry. Hope that helps! This tasted amazing. Thanks for the recipe.I’m freezing it to have again. This looks amazing! Can it be made a day or two ahead of time, frozen, and then baked? If so, how long could it be kept frozen? 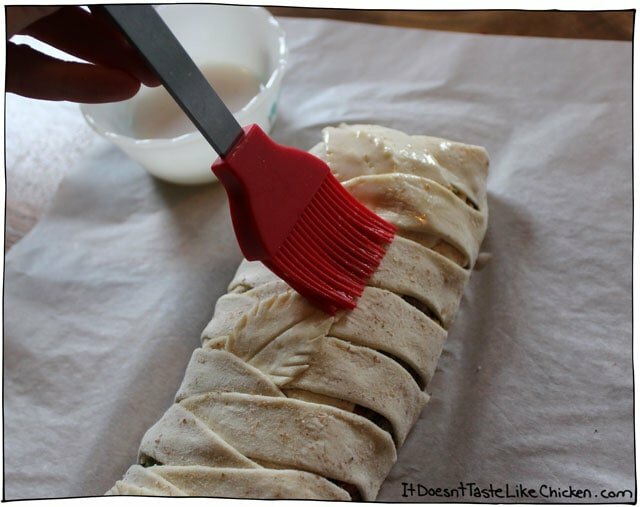 And would you need to let it thaw before putting in the oven? If so, for how long? And does that change the cooking temperature and time? Or, if not frozen … at least kept refrigerated for a day or two? This looks so good, it’s going to be my main dish for Christmas. Thanks for the recipe and photos. Hi Sam! I’ve been vegetarian for about 4 months now and am really trying to make the transition to fully vegan. I’m making some slow changes now and by January I want to participate in Veganuary. I mean really, could there be any better way to kick off a new year than going vegan? I think not! I’m so excited to try this recipe! I had planned to make a traditional lentil loaf this weekend and my Omni fiancé was less than enthusiastic. He absolutely loved your creamy red pepper cashew dip though so I’m sure if I let him know this lentil loaf is coming from the same mind he will be much more likely to get on board. This is so much prettier and quite frankly I trust your recipe more than the random one I found online. I will absolutely reply back with how it turned out. If it looks half as beautiful as yours does I’ll be sure to share a picture to your Facebook page. Thanks for what I’m sure is going to be another winning recipe! Congrats on your new vegan adventure!! I agree, no better way to start off the year. Everybody I have served this loaf to (regardless of their dietary choice), has loved it, so I am sure your fiancé will too! Hi there! I made this recipe for my omni family on Thanksgiving. It was so easy and there were no leftovers! We just made it again last night, only I doubled the recipe to make two loaves (one recipe) and then a bag full of the filling for when we want burgers. I hope those turn out well, I’m sure they will. Thanks for all your great recipes. Do you think I could freeze the who loaf (with the uncook pastry, a homemade version that has never been cooked) and use it a couple of days later? I’m making it for 2 christmas dinners a few days apart… Would be so much easier to juste make 2 the first day and freeze the second one! Hello, I am really excited to try this recipe but I live in China and have a very small kitchen. Could I possible cook everything in a slow cooker then put it in the oven? The oven is needed to crisp up the pastry and get flakey, I think if you put it in a slow cooker it would get soggy, and not have the desired result. You might have better luck trying this Pumpkin & Lentil Shepherds Pie recipe. I hope that helps! I made this for my plant-based Thanksgiving today and it was AWESOME! Such a great center piece. I showed my daughter the pictures of the puff pastry process and then left it up to her artistic divine. She decorated one with a mermaid and hermit crab and the other with leaves and acorns. It was so delicious and the recipe was easy to follow. Great recipe! I’m so glad that I took the time to do something special. I would love to see the mermaids and hermit crabs! So creative and sounds gorgeous! I plan on making this vegan loaf this weekend for my vegan friends in the UK! The only problem is that one of them is allergic to nuts. 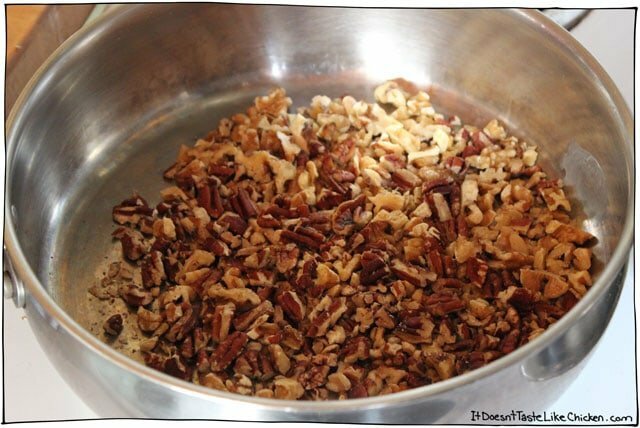 Is it ok if I omit the pecans and walnuts? Should I replace them with anything? I don’t want this to ruin the texture. You can definitely skip the nuts. The do add a nice texture difference, but I don’t think it will ruin the texture, I’m pretty sure it will still be delicious. Enjoy! I haven’t made this yet but it’s on the menu! So amazing! Can you please tell me what I can substitute for the mushrooms? My dad cannot eat them 🙁 BUT I must make this dish! Thanks for the inspiration and for sharing such a master piece! You can just leave the mushrooms out and the recipe should work just fine. If you like you could increase some of the other veggies by a bit. I hope you enjoy the recipe! When I’ve had to substitute mushrooms in the past (for different recipes), I used some sauted parsnip. It works great! 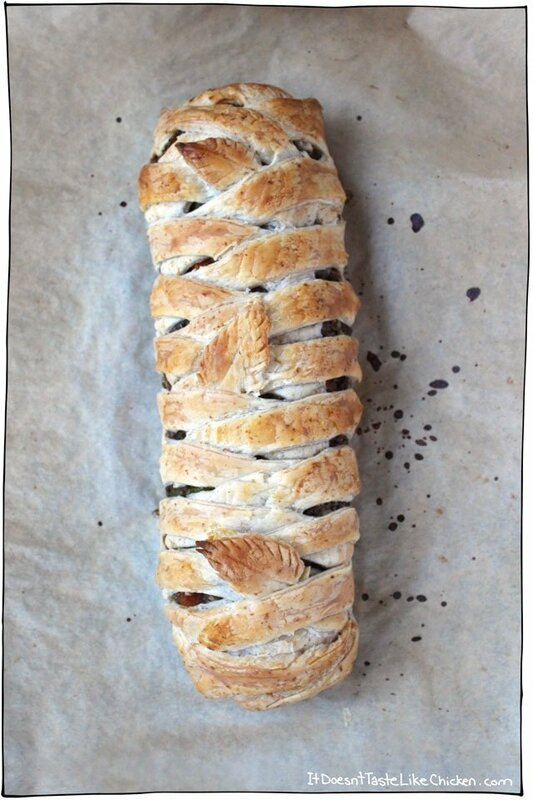 Hi, I am going to make this for Thanksgiving…our daughter-in-law is vegetarian not vegan, so just wondering if there is anything to use in place of the flax?…Do you need it to hold it together? I just don’t feel like buying it for that small of a amount. Yes the flax helps it hold together, and you can always store flax in the freezer (I do), so it keeps for a very long time. I believe I remember one reader telling me they skipped the flax and it worked fine just as it was, but I haven’t tested that myself, so I don’t know how it will turn out. I hope you enjoy the recipe! Hi! Thank you for making and sharing this recipe! I’m so excited to try it for Thanksgiving this year. I have to make it up 4 days ahead of time because I am traveling for Thanksgiving and going to several different dinners. I can cook it the day of, though. Should I freeze the filling since I have to make it that far in advance? Would that change the texture or make it watery? Thank you! I’m curious that I have not ever come across vegan puff-pastry. Puff Pastry traditionally takes butter, and lots of it to become puffy. If you have a brand that is vegan, I’d truly appreciate if you could share it. Otherwise, I think true vegans might want to reconsider this recipe. I think the recipe for the loaf sounds great, and am putting on my thinking cap to come up with an alternative to the puff pastry. While traditionally puff pastry is made with butter, most of the premade frozen store bought varieties are vegan, just check the ingredients to make sure. Two brands are Pepperidge Farm and Tenderflake. 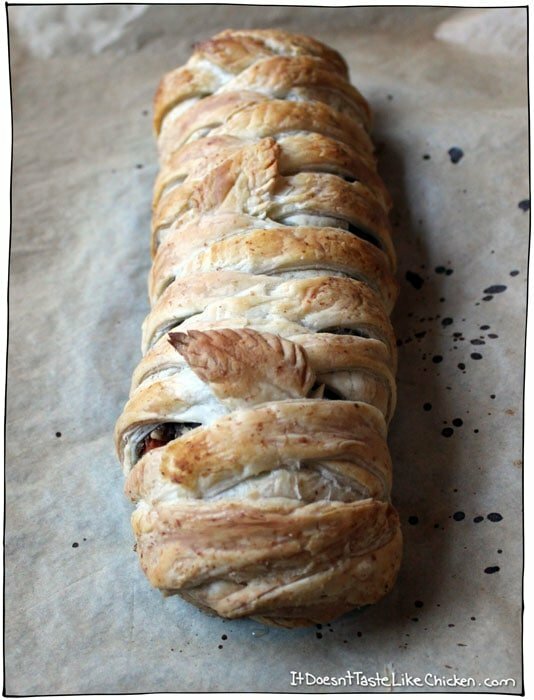 Of course if you can always make your own vegan puff pastry, here is a recipe. Hope that helps! Diane–just wanted to comment that I bake a ton, sometimes vegan, and you can use coconut oil pretty much anywhere a recipe calls for butter. I even prefer coconut oil in some pastry recipes like pie crust, for the very subtle nutty flavour. Or, as the recipe Sam shared suggests, vegan butter works too in a homemade version. Puff pastry is not terribly hard to make from scratch, although it takes some time. An alternative is a pastry called rough-puff, which is mixed up like a traditional pie crust (mix flour, salt, and cubed fat of your choice until the fat bits are pea-sized, then add tablespoons of ice water mixing gently only until dough forms a shaggy ball, then scoop into a ball and let rest 30 mins, roll out into whatever you’re making) but you roll it out into a rectangle and fold it letter-style a few times, rotating after each fold. This will give the flaky layers of puff pastry without taking up tons of time, and coconut oil should work perfectly well! I’m planning on making this recipe with homemade rough-puff for my vegetarian Thanksgiving this week! I can’t get off your blog today! I’m favoriting everything. This will be my first vegan Thanksgiving. I was vegetarian before and cooked Tofurky roast. I love that stuff an unnatural amount, but I would really like to make something special (and that doesn’t cost a fortune because we need four of those little roasts $$$$). This looks incredible! Your pictures and detailed instructions are wonderful and make me feel like I can manage the braid. I’ve never had puff pastry before, but it looks delicious! This looks like a winner. Can you tell me how one might prepare in advance without undermining the crispness of the pastry? You could prepare the filling in advance, and then wrap and then bake the puff pastry about 50 minutes before you would like to serve the dish. Hope that helps! Ahaha, yeah sorry, I don’t know. Perhaps you can make the whole thing ahead of time, but I have never tried that, so I have no idea how it would turn out. Best of luck! I made this last weekend for my Fiancé and I as it was an early Thanksgiving for us! It was extra special because it was our first Thanksgiving as vegans! This recipe was incredible! It was better then roasted turkey and I served it along side vegan stuffing, mashed potatoes and breaded zucchini! My fiancé said it was so delicious he planned on having seconds later on…. he didn’t end up eating a second helping because the lentil loaf is so hardy and filling and the lentils keep you full (but not in a disgusting bloated ‘I just ate a turkey leg’ kinda way). This is my new fav vegan blog, I’m blown away and can’t wait to try more recipes!! WOW!!! Made this yesterday and when my husband came home he said the smells from outside were AMAZING!! Absolutely delicious – thank you for this amazing and new favourite reipe!! This sounds yummy! BUT I am gluten free so I will make just the loaf part – I am always on the lookout for a good lentil loaf. Thanks! This was delicious, pretty and had a great consistency that sliced and presented like a champ. I did sauté the vegetables in wine instead of oil but even my confirmed ‘mushroom haters’ and omnivores gave this 2 thumbs up! This one is a keeper. Worth the work! I made this last night, it was fantastic, the perfect winter comfort food. I served it with mushroom gravy , Brussels sprouts and roasted potatoes, I felt like a queen eating such a fine meal. Next time I will double the filling recipe and freeze half so I will have an almost ready to serve meal for the next time. Thanks for the recipe !!! I am so happy that I found it. Oh yay! I love good winter comfort food. Freezing the filling for later is a great idea! I have a miniature freezer so I never get to do stuff like that. I made this for xmas dinner and it was excellent! Leftovers were great too. I made some substitutions because my husband hates nuts and mushrooms. I used eggplant instead of mushrooms and just increased the carrots, celery and onion instead of the nuts. It was great. Thank you! I’ve been vegan for over 20 years now and love finding new recipes. This loaf is on my urgent “to do” list. Thank you Ariana. Congrats on 20 years, you’re an inspiration! Looks so yummy. Aiming to make this Christmas day. I’m probably being quite ditsy here but what is the vegetable broth? Is just stock? Yes, vegetable broth is also known as vegetable stock. Merry Christmas! This looks like such a terrific dish – Thank you for sharing this!! I am looking forward to making it and will likely use as a side dish. Some family members are not big on lentils (significant understatement, ha ha) so I was trying to think of some ways to either substitute at least half of the lentils or replace with something else that will still make it possible to retain the “loaf” status. Are there other legumes (maybe black beans) or perhaps stiffly mashed sweet or yukon gold potatoes that would work as suitable stand-ins? Usually, I am pretty good with finding substitutions as needed, however, I want to be careful to not completely change the flavors or consistency. Thank you for a wonderful recipe !! Hi Shirley! I think black beans, or any other small bean would work just fine, (although I have not tried it myself to confirm). Make sure to overcook them a bit so that they get mushy and become the “glue” to hold the loaf together. Enjoy! What a wonderful looking and sounding recipe. I’d love to make this ahead and take it up to family for dinner. Do you think freezing after step 10 would work? Then thawing the night before and baking? I’m allergic to oats. Do you think I could use precooked brown rice as a substitute? Hi! Yes I think that would work just fine. Enjoy! my husband is allergic to mushrooms so what can I use instead? Thanks Bella! I think you would be fine using other nuts, but the reason i like walnuts is that they are soft. A hard almond amoung the softer loaf texture kight be a bit odd. If you are to switch up the nuts I would a softer textured nut. Enjoy! That’s funny, I remember in grade school when the bully in my class called me Trunchbull trying to make me feel bad. I just giggled with joy and said I loved it because I am a huge Roald Dahl fan! The bully was not impressed. Haha! Hahaha! It’s actually not that tricky. If you want to avoid weaving the pastry, you can just roll it up. It might not be quite as spectacular but you could cut a few designs or even just slits into the top for some decoration. Thank you so much for the blog love! Makes my day! I love your blog and your yummi recipes ! I can’t tell you how delicious this was…wait, yes I can. This recipe was amazing. I had some leftover country gravy left over from the night before (chicken fried seitan) which was perfect! My seven year old thought the inside looked gross, but said it tasted good. She picked it apart but ate a good portion. My other kids loved it, as well as the husband. I made this for Thanksgiving and it was outstanding! I’d definitely make it again. I’m also glad that I didn’t half the recipe like I was originally thinking–two loaves are better than one 🙂 Thanks for sharing! Yay! I am so glad you loved it!! Thank you for coming back to leave a comment. Two loaves are totally better than one, especially when we are talking about puff pastry. Yum! I really want to try this! We’re spending Thanksgiving at my (non-vegan) step son’s home so I want to bring delicious food that 1) My husband and I can eat and 2) My step son’s family will find so delicious that they will contemplate going vegan. Ha! Fat chance, but maybe they’ll eat a little less meat. Haha! We can always hope! I think this recipe will work just great for you and your non-vegan family. I hope you enjoy it Debbie! 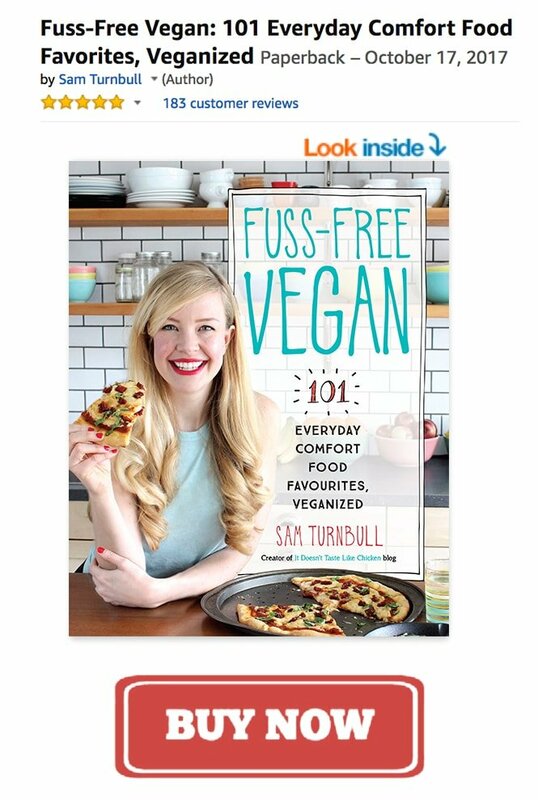 Wow, I’m so excited to make this for my non-vegan family members coming over! The mushrooms aren’t listed in the ingredient list. Is it 8 ounces of mushrooms? Thanks! Hi Christiana! Yes, sorry I missed that, you are right 8 ounces of mushrooms. I fixed the recipe now to include the mushrooms. I hope you family members love it! I love that the filling for this beautiful dish can be made ahead! I’ll be taking advantage of that since it will certainly make my Thanksgiving food prep go more smoothly. I’m writing up my shopping list right now and am wondering what quantity of mushrooms are needed. I noticed them in the pictures but not in the list of ingredients. Oh silly me, can’t believe I forgot to write down the mushrooms! Thank you for pointing that out Carolyn! You need one 8 oz. tub of mushrooms (which is about 3.5 cups). I hope you enjoy the recipe! Love, love, love this, Sam! What a beautiful presentation and delicious offering for a festive holiday celebration! And, I mean, puff pastry!? Wow! And those little leaves tucked up in the lattice… oh! Whats not to like? Nutritious, vegan, hearty and feeds a crowd! Thank you for sharing this lovely recipe! Thank you, thank you, thank you Traci! I know, puff pastry… Can you go wrong with puff pastry? I think we all know the answer is no. Thank you for your lovely comment Traci. Wow! 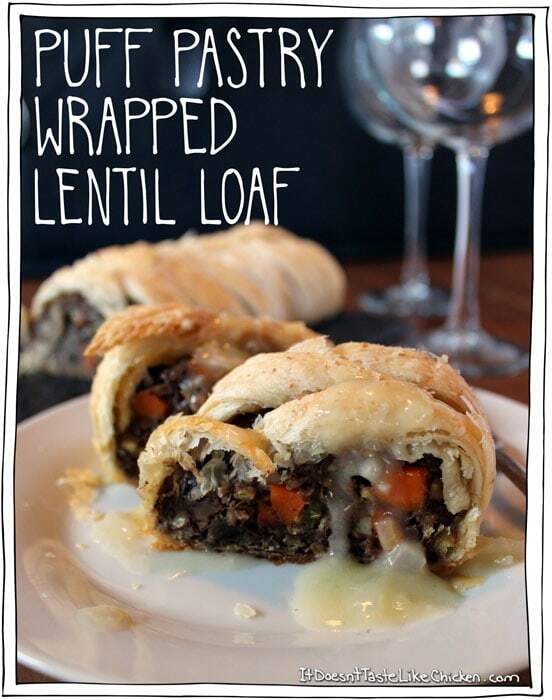 I would never have thought of wrapping a lentil loaf in pastry. The filling sounds absolutely delicious, and I love the little pastry leaves you poked into the top! Thank you so much Becca! I love simple touches like that to make things prettier. It doesn’t have to be leaves either, I was thinking of doing little ginger bread men, but then I thought it might look like they were trying to escape prison break style. It’s amazing how mushrooms have become such a great substitute and filler for proteins. Would probably be good with any mushroom, nice work! Mushrooms are only a small part of this dish, there is so much more yumminess too with the lentils, toasted nuts, sautéed veggies…omnomnom. Yes, I think any mushroom would be great here. That sounds so delicious and it is lovely looking, great for serving to company! Thank you Joann. Yes it is pretty. I love puff pastry!! haha. This is beautiful! I want to (and will) make this one day. We are traveling South Thanksgiving Day (my first Thanksgiving as a Vegan). There are so many wonderful Vegan recipes – such as this – it’s almost a shame! I think I will make us a little Thanksgiving feast once we arrive at our destination. This would be a lovely dish to bring to Christmas dinner, too. Thank you. Thank you Kathy. Haha it’s true. People ask me “but what do you eat during the holidays! ?” as if there was no options other than dead bird. Being vegan lets you get so much more creative. I love your idea of a little Thanksgiving feast upon arrival. Share pictures! Very gorgeous, but I like your beautiful step by step photos first and the printable at the end. If I did this it would look like a zombie with stuff spurting out. You do it so elegantly. Yeah Art Degree! Hmm ok thanks for the feedback! I will consider re-arranging. Haha! I promise it’s really easy to do, but if you are afraid to do the braid wrap, you can always just roll it up in the puff pastry and bake it just like that! As per your suggestion (and others who agreed) the printable has been moved to the bottom. I hope that is easiest for everyone! Thanks Arlene! I am sure it would work great for a buffet! haha.